Bird of Paradise Necklace II is a cloisonne jewelry piece created by Patsy Croft. It belongs to Tropics collection of amazing handmade enamel jewelry with unique jewelry designs. 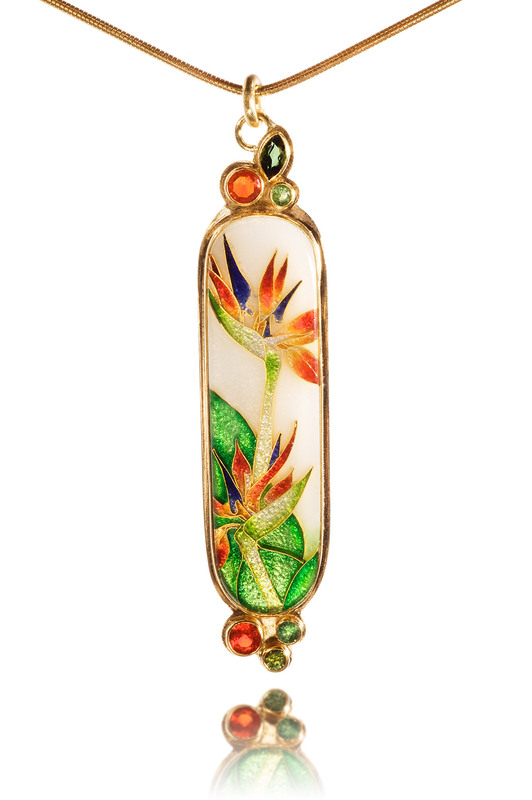 The Bird of Paradise flower of transparent enamels is offset with a beautiful opal enamel creating an eye catching cloisonné enamel jewel. As an cloisonné jewelry artist I and began my goldsmith career, I was fortunate to move to Hawaii and experience the lush tropical forests and ocean vistas. It was then that I realized that the Bird of Paradise was my favorite flower. This stunning piece of cloisonné jewelry was made by drawing designs with 24k gold wire and slowly placing, grain by grain, the layers of enamels into each cell. Using vibrant transparent and opal enamels, this created depth and movement in the cloisonné enamel jewel. The green enamels are captivating, drawing your eye to the namesake feathered creature. The flow of the orange enamels are remarkable, showing curvature and depth of the actual botanical. This unique jewelry design is set in 18k gold with Fire Opals and Green Tsavorite Garnet gems, making it a one of a kind gold jewelry piece. The whole metal canvas vibrates warmth, beauty, thoughtfulness and joy.